Chocolate-covered strawberries pair well with pink champagne. Whether you’re hosting a sophisticated affair, want to impress your spouse, or just expand your knowledge in the culinary arts, you’ll benefit from knowing some great ways to pair chocolate with champagne. Delight your taste buds and find ways to successfully highlight the beauty in the flavor profiles of the chocolate and the champagne. Follow this guide to get started. Choose a sweet champagne to pair with your chocolate. A couple terms that should jump out at you when you’re making your selection are demi-sec and doux. Another great option is a pink champagne or sparkling wine. Be sure to steer clear of vintage bottles; instead, shoot for selections that have higher residual sugar content. 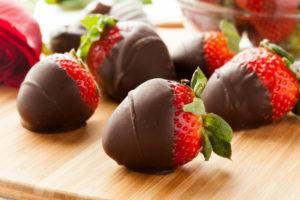 If you’re having your chocolate in the form of covered strawberries, pair pink champagne with milk chocolate. This will create the perfect marriage of the red fruit infused into the beverage and the sweetness of the chocolate and strawberry. The creamier, sweeter cousin of chocolate requires a selection that has a light to medium body. Another great tip is to look for choices that have lower levels of alcohol and higher sugar content to match the inherent themes of the flavor profile in white chocolate. Of all the different varieties of chocolate, milk chocolate tops the list when it comes to versatility. This fact gives you access to a greater range of champagne for pairing. The flavor themes within champagne easily pick up the various notes of the milk chocolate, including its high level of sugar and low tannins. Pair milk chocolate desserts like German chocolate cake or even chocolate paired with sea salt with your champagne selection. GET READY FOR FALL WITH WOCKENFUSS! With gourmet chocolates and candies this good, you will find the best candies for every guest at all of your fall get-togethers! Since 1915, Wockenfuss has been a family owned and operated business creating the finest confections in Baltimore, Maryland. With our nine convenient locations throughout Maryland, there is sure to be a Wockenfuss store near you. Come and visit us to see our selection of summer favorites such as our gourmet truffles & chocolate specialties. We’d be happy to help you select the perfect sweet treat, whether for you or as a gift for a loved one. If you have any questions about our sweet seasonal candies, please contact Wockenfuss Candies by calling us at 1-800-296-4414 or emailing info@Wockenfusscandies.com. When you’re not savoring our sweets, stay satisfied by following us on Facebook, Twitter, Google+, and Pinterest, too! This entry was posted on Thursday, September 27th, 2018 at 10:15 am. You can skip to the end and leave a response. Pinging is currently not allowed.